Amsterdam is a treasure, and the coffee houses are great too. Coffee shops in Amsterdam are definitely worth a visit. Beauty, culture, and social tolerance make Amsterdam an ideal destination for any adventurer. After Venice, Amsterdam is my favorite European city, and for the same reasons. Amsterdam is a Renaissance city build by the mercantile class. The great beauty of most European cities came from Royalty or the Church. The riches that built Venice and Amsterdam, came from seagoing commerce. Amsterdam is a city of, and by, the nouveau riche. Amsterdam was to the new world what Venice was to the Orient, a port city of traders, smugglers, pirates, and arbitrageurs. These adventurers got rich importing goods from far off lands. They sometimes took even more profit by evading or avoiding government import duties. Like Venice, Amsterdam is built on low, reclaimed land – swamp. Swamps make great places for pirates and smugglers to hide. When you’re being chased by a navel “man of war”, heavily laden with cannon and drawing deep, the shallow maze of inlets in a marshy estuary makes an excellent place to hide. Navel captains are remiss to chance beaching an expensive capital ship over a small boatload of spices or tobacco. Marines are equally reluctant to trudge through unfamiliar swampland. Like Venice, as Amsterdam grew rich, it became legitimate. Smugglers and pirates accumulated wealth and most eventually preferred to pay tariffs rather than play “cat and mouse” with royal navies. As the city-states grew rich, swamps were drained, canals were dug, and palatial homes were built. Today, both cities are a wonderful maze of canals lined with beautiful Renaissance homes. Both cities were Renaissance party towns. The nouveau riche love to show off their wealth. By surrounding themselves with nice things, the nouveau riche sent a message to the old guard – “we’ve made it.” The nouveau riche in both cities announced their arrival to the upper classes by collecting great art, building grand estates, and throwing outlandish parties. Sadly, Venice withered into decay. Today, only the life support of tourism keeps it alive. Amsterdam, however, still thrives as a vibrant city. It still feels like a cosmopolitan, tolerant, international city dedicated to commerce. The spirit of adventure and mercantilism is still alive and well. 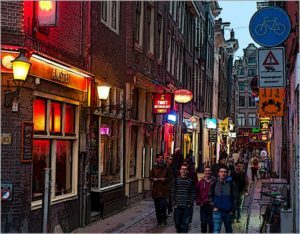 One of the most visible examples of tolerance in Amsterdam is the marijuana trade. Coffee shops are where you find marijuana in Amsterdam. The local joke is that anyone asking for coffee in a coffee shop is a tourist. Coffee shops are wonderful fun and they do serve high-quality espresso, on par with the best Starbucks. It’s a little intimidating for an American to enter a Coffee shop for the first time. Americans are so used to the illegality of marijuana, most find it hard to believe you can consume it openly without legal retribution. Upon entering a coffee shop, the first thing you notice is the smell of the smoke. It’s a sweet smell of the best marijuana you ever smelled. The pot is grown in laboratory conditions and contains an extremely high THC content (the stuff that gets you high). In fact, most locals don’t smoke it straight. They prefer instead to mix it with an equal portion of the tobacco from a Marlboro cigarette. The next thing you notice is the relaxed nature of the room. People sit around at small tables, on bar stools, and in pit groups, laughing, talking, smoking, and openly rolling joints or packing pipes. If not for the marijuana smoke, you might mistake it for a dimly lit Starbucks. On my first reconnaissance, I entered the coffee shop and made the above observations, then timidly made my way to the bar. On my left, a young lady was finishing a roach and sipping a small cup of coffee. To my right, a couple was facing each other and whispering. The bartender addressed me in perfect English. The bartender smiled broadly and turned toward the espresso machine. In a couple minutes, he returned and handed me a small china cup and saucer. The espresso was a fragrant dark brown, with a thin créma covering the surface. In addition to the espresso, the saucer held a three-inch long tube of sugar, a small espresso spoon, and a small cookie. Wonderful. The bartender reached under the counter and produced a menu card listing ten varieties of marijuana. I took the menu and began to read. Each selection had a distinctive name such as White Widow, Red Cherry Berry, Pineapple Chunk, Laughing Buddha, etc.. I studied the menu for a moment then addressed the bartender. “What do you recommend?” I asked. “How do you want to feel?” he asked. For some reason, the pot-selling area was segregated from the coffee selling area. I descended the steps and walked up to a Dutch door, literally a Dutch door with the top half of the door swung open. The cashier on the other side was concluding a transaction with a gentleman in front of me. “Twenty?” the cashier behind the half door asked. “Yes, twenty,” the customer answered. The man behind the door disappeared into the dimly lit room for a moment, then returned with a bag and a china plate. He spilled twenty pellets of hashish from the bag into the plate. Each pellet was about a half inch in diameter and a half inch long and made a hard tinkling sound as they spilled onto the plate. The customer handed over a fist full of Guilders and the man poured the pellets back into the bag. He handed the bag of hash to the customer and made change. “Thank you, enjoy,” he said. The man with the bag of hashish moved away and up the steps. I nervously stepped up to the counter. “I’ll take a gram of the Laughing Buddha,” I said. The cashier obediently walked over to a shelf lined with small boxes, He returned a moment later with a small ziplock bag. The bag was just big enough to hold a bud of pot about the diameter of a quarter. I paid the cashier and returned to my stool at the bar. I suddenly realized I didn’t have any papers or a lighter. Fortunately, I noticed that behind the bar were various pot smoking supplies and paraphernalia. There were pipes, papers, lighters, pipe cleaners, cigarets, etc.. I asked the bartender for a pack of rolling papers. It was then I noticed that there were about ten different varieties of papers. “What kind would you like?” asked the bartender. “Are you skilled at rolling joints?” he asked. “Are you smoking the weed straight?” she asked. She took the twisted mess I had created and skillfully straightened it into a good looking, tightly rolled joint. She smiled and then handed it back. I lit the end and offered it to her. She took it and drew deeply. I hit the joint again, this time I drew the sweet smoke deeply into my lungs and held it. A warm, relaxing sensation immediately hit me. The corners of my mouth began to draw tight. I couldn’t resist smiling. This was good pot. The couple to my right turned toward me. “Where are you from mate?” said the young man. It was immediately apparent he was from either Australia or South Africa. I couldn’t quite place the accent. “Sydney,” the young man answered. “My wife and I are touring Europe. This is our first stop; we may not leave,” he said laughing. I hit the joint again. Wow. Two hits and I was stoned to the B-Jesus. The room suddenly seemed warm and friendly. I was no longer an outsider. The bartender walked over.